Nations Press feature news VIRAL: A Captured Flying Lemur,Mistakenly Identified as "Aswang" Goes Viral! VIRAL: A Captured Flying Lemur,Mistakenly Identified as "Aswang" Goes Viral! SPONSORED LINKS The kagwang is endemic to the Philippines, particularly in Mindanao Faunal Region. Bohol.ph lists as an endangered species. 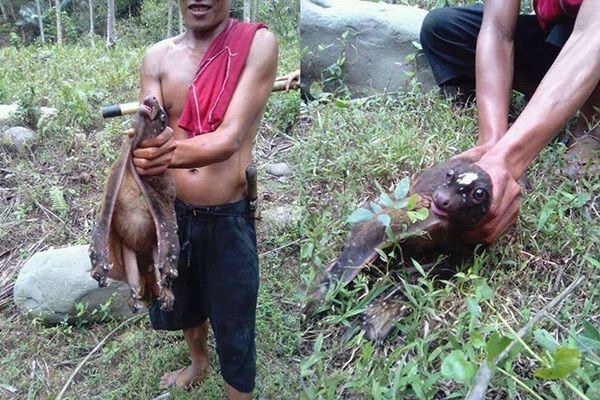 A photo of this flying lemur is now circulating online and was mistaken as "Aswang" by many netizens. The lemur is shown being restrained and it is unclear where and how it was caught, and if it is still alive. The photo has been shared over five thousand times since posting, with many spreading information about the flying lemur and discouraging violent behavior against it and other animals. Contrary to the user's claims that the kagwang attacked other animals in the area, it is actually a "folivore" or an animal that mainly eats leaves.